Archibald Henry Sayce (1845-1933) became interested in Middle Eastern languages and scripts while still a teenager. Old Persian and Akkadian cuneiform had recently been deciphered, and popular enthusiasm for these discoveries was running high when Sayce began his academic career at Oxford in 1869. 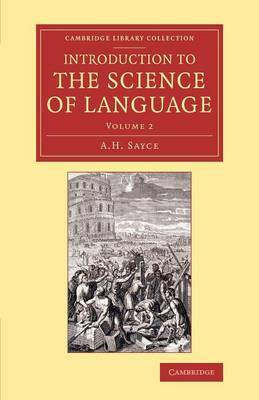 In this two-volume work of 1880, Sayce attempts to give 'a systematic account of the Science of Language, its nature, its progress and its aims'. As he explains, the methods and theories which underlie the work were set out in his 1874 Principles of Comparative Philology (also reissued in this series). Volume 2 deals with language groups (both ancient and modern), examining separately the inflexional families with their root/inflection system, and the systems of agglutinative languages, before discussing comparative mythology, the origins of language, and the place of the science of language in the wider social sciences. Sayce also provides a bibliography for students.